The 3D- Magnetic Field Analyzer NFA 30M built by Gigahertz Solutions measures magnetic alternating fields. The 3D- Magnetic Field Analyzer NFA 30M measures magnetic alternating fields as required according to the German regulations for sleeping berths. The measured data is stored at a SDHC-Memory Card. Max. Storage Rage up to 110000 Samples per Second. Max. Running-time of 3D- Magnetic Field Analyzer: 48 hrs. - Separate data storage for line- and traction-current as well as harmonic with TRMS-rating. The 3D- Magnetic Field Analyzer achieves the standards of german regulations for sleeping berths. 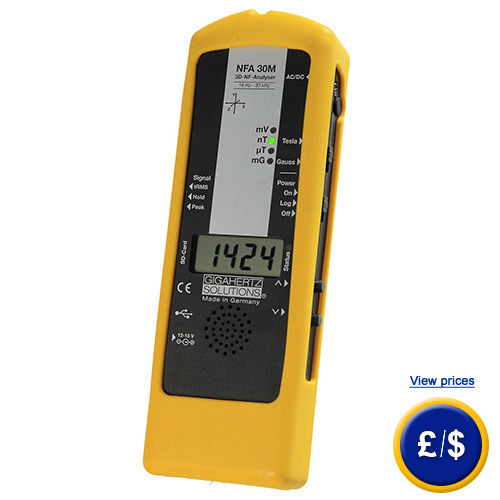 The Magnetic Field Analyzer runs by 7.4 V rechargeable battery or adapter (within the parts package). In case that you have any questions about the 3D- Magnetic Field Analyzer NFA 30 M, read the technical data or get in contact with us: UK customers +44(0) 23 809 870 30 / US customers +1-410-387-7703. Our technicians and engineers will inform you about our magnetic field analyzers or any other product of in the field of Regulation and Control, Measuring Instruments or Scales and Balances of PCE Instruments.